Having owned my '99 for a couple of years now, it had become obvious that the charging system was not up to the job. It was getting 13.6v at idle but when at cruising speeds, voltage dropped to 12.3v. Looking through the forum for remedies, I came across advice to do "the drill". This is a systematic troubleshooting procedure. Do this first to determine if your issues are stator or R/R issues. It turns out that my stator was in good condition so problem had to be the R/R to system. Not sure of R/R failure since it was producing. I then came across another forum post with heading of "Tips & tricks to help your charging system". In summary, his point is that the system from the regulator has undersized wires that are too long of runs. 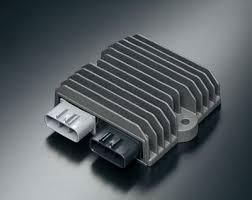 Connector block voltage losses & poor grounding add to the unsatisfactory charging performance. Read his post for full understanding of remedies. I did just a quick implementation of his advice giving the effort only 50% of working. When I fired up the engine, IT WORKED!! I decided to go back into the wiring and get it set up for the long term. I cut the stator connector block out, installed ring connectors sized for 4mm machine screw by crimping and soldering. One side will need a wire extension. I inserted lengths of surgical tubing for insulation, then bolted the appropriate wires together with screw & nyloc nut. Side the tubing over the connection and zip tie for waterproof. Dealt with output side of the R/R by cutting out the connector block and installed ring connectors sized for 4 mm machine screw by crimping & solder. Add wire extensions to the regulator side. Connect all positive leads on one screw/nyloc along with a direct fused lead (use 15A fuse) to the positive battery post. 5 ring connectors on one screw. 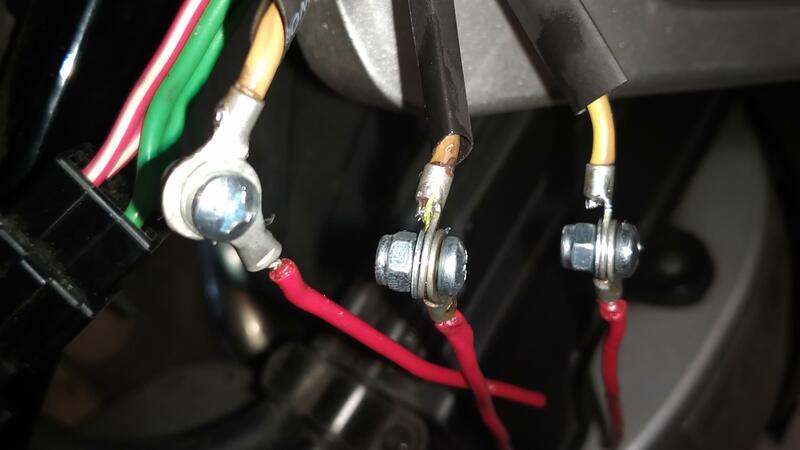 I connected all negative leads on one screw along with a 8 ga wire going to the main grounding point on the right frame side then to the negative batter post. The 8 ga wire is very heavy, hard to deal with & kind of overkill. I think 10 ga is plenty fine. Again, 5 ring connections on one screw. For insulation, I took some 20mm clear tubing, cut it lenghwise, heated it up, wrapped it around the connections and zip tied. These connections are not waterproof but allow for drainage. Use di grease to protect if desired. Replace the main 30A fuse with a 15A. This, along with the new reg to battery fused lead gives the needed 30 amps. I now have 14v at idle and 13.7v at speed. This is a new approach, and I like it. The only thing I'm lost on is the 15a fuse. I am not sure about the fuse size being halved in this arrangement. In the tips & hints thread there was mention of fuse sizes but don't know if that is a fact. Better safe with the 15 amp fuses than risk burning things up. I haven't had a 15A blow yet, but spare 15 & 30a fuses are at the ready in the tool kit. Thinking more about the fuse size coupled with this 2 battery pathway system. First of all, I am not a electrical engineer. However, I believe the following is the way the fusing should be. I am pretty sure that amperage is comparable to water in a volume/time (i.e. gal/min) aspect. Understanding the fuse requirement to keep the system safe in this 2 battery pathway arrangement is easier if put into gal per minute visualization. To achieve the stock system requirement to limit flow of electrons (water) in the single battery pathway the designers put in one 30 gal per min safety valve (30 amp fuse). When a 2 battery pathway system is installed with 30 gph safety valves to each pathway, the system will allow 60 gph into the system before one of the safety valves will shut down. I believe the fuses at 30A each would behave the same and allow 60A into the system before either fuse would break. Hence, I would recommend 15A fuses on each pathway for a total of 30A for the double battery pathway modification. If the two fuses are in parallel, then yes, you would want two 15A fuses. If they are actually in series, then you would want to have only one 30A fuse. The water analogy is correct (enough) for current flow, so if you had 3 different paths from the regulator to the positive terminal of the battery, you would want three 10A fuses. I'm confused about this multiple path thing though. 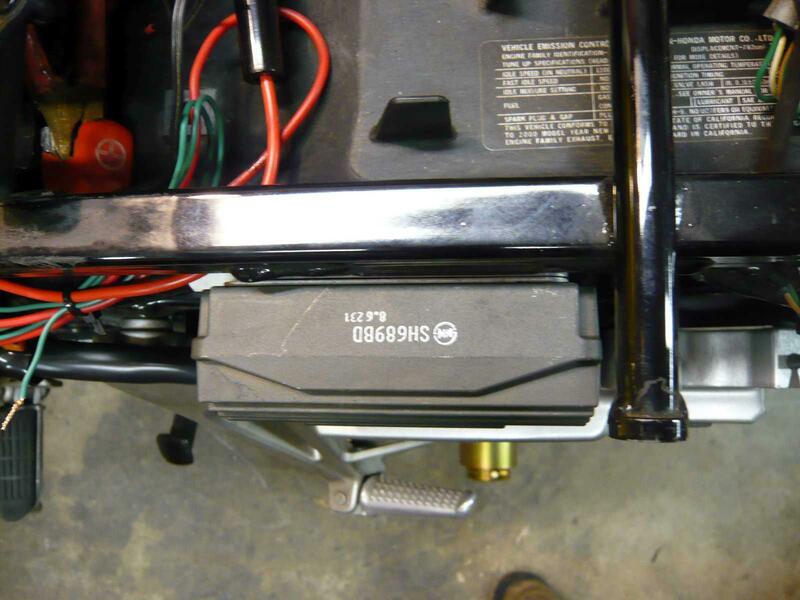 Did you add another wire straight from the regulator to the positive terminal of the battery? So that you have your new wire in addition to the regular wire that goes to the fuse box (then to the battery)? If that is the case, then yes they are in parallel and you would want a 15A fuse on each path. In essence, a new direct path from the regulator to the battery was installed. It is now a solid charging system with today's ride showing a 14.1v idle and 13.8v at speed. Remember, Fuses are to protect your wiring, not the devices hanging off the wiring. 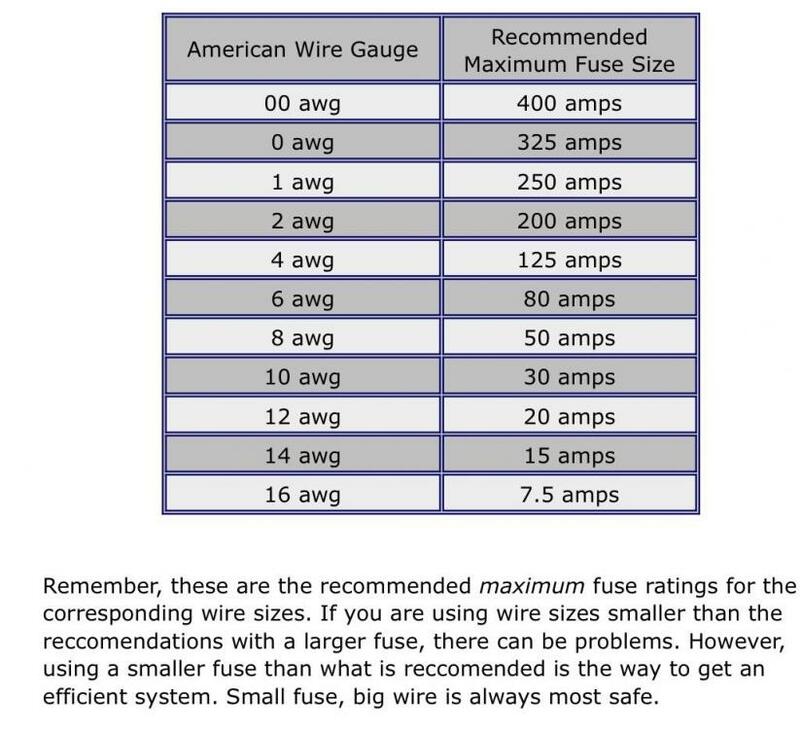 A fuse needs to be rated to protect the smallest gauge wire on that power line. Hi Fritzer. 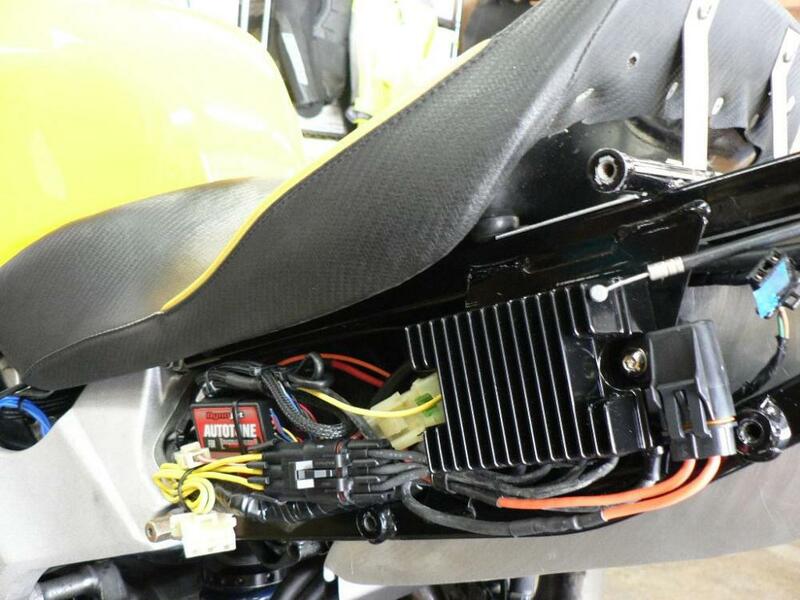 Neat wiring job but a little concerned about the wire gauge you used on the Stator output yellow wires, your red ones look like a smaller gauge! Should be equal or slightly larger, never smaller. Why did you use the eyelets and not just solder those connections? Adding unnecessary mechanical connections and complications on a circuit that experiences a variety of temperatures, weather conditions, and vibrations is probably not the best. I used ring connectors to have the ability to disconnect the R/R from the bikes systems for testing purposes in the future (i.e. you don't have to cut and resolder every time you need to test). Also, the effort to bring 5 wires together, in a clean & compact manner, is very difficult with soldering. The voltage drop with the ring connector method is very negligible, so this way made sense to me. If you are a artist with the soldering gun, go for the solid connect if you don't care about disconnection in the future. In response to Grum's observation of stator wire gauge. I was surprised at the wire gauge coming out to the stator when I did the blockectomy. They were 14ga or smaller. I used a 12ga wire to extend to the R/R. I used ring connectors to have the ability to disconnect the R/R from the bikes systems for testing purposes in the future (i.e. you don't have to cut and resolder every time you need to test). Cant you just.. unplug the stator wires from the RR to test? Same with the 12v connector? Don't take this the wrong way, but I'm shaking my head going "why?!" over and over again. Ok apologies here, the Yellow wires confused me, they are Not the Stator output, but the Input wires to the R/R. The red wires are just an extension of the Yellow Stator Output wires!!!! . I'm fairly certain you are talking about exactly the same thing. On stator output wiring extensions, I think it is just the angle of the first photograph that makes those wires look small. Are those the three red wires we see in the second picture entering the latex tubing from the left? Ring to ring isn't a bad connection, there is a good amount of surface area and the fastener helps maintain good contact better that the spring tension of tin/copper terminals. Downside is that it isn't very pretty. I would encourage you to get brass screws rather than the zinc plated you are using. You've got a lot of dissimilar metals (including god knows what alloy the screws are actually made of) going on there and the chances of forming corrosion can be reduced. Think about the screws on an outlet or switch in your house, we are usually talking (plated) brass or tinned copper; I can't ever recall seeing steel of any kind. Maybe on really cheap stuff? The stator wires are the ones going to the surgical tubing. The regulator wires are insulated with the clear tubing. The machine screws are 4 mm stainless steel and a zinc nyloc nut (that is what my local ACE hardware had in stock). I will keep an eye on the connections and change out if corrosion becomes a problem. The nice thing about the the tubing for insulation is that you can see the connections when you take the body work off. Stainless steel isn't as good an electrical conductor as steel or brass, but it works okay--and you're only using them to hold the ring terminals in contact with each other anyway. I use them on my battery terminals, too. I see that you've eliminated the OEM reg/rec connectors, but I'd just have swapped them for modern sealed automotive connectors (e.g., Delphi Metri-Pack 630 or 480) and called it a day. You can also get sealed fuse holders (and relays) to match. This is my Y2k with a 3P Delphi Weather Pack connector (which the Compu-Fire reg/rec was already equipped with--since ditched!) 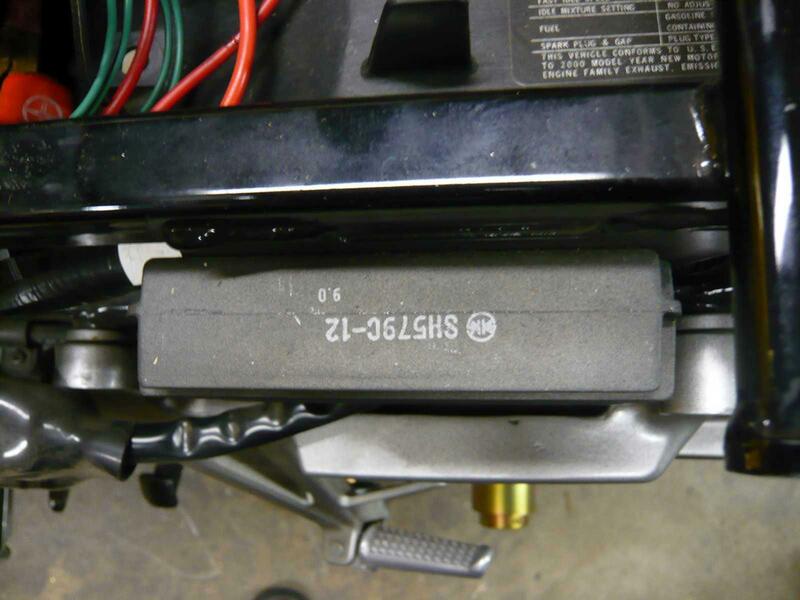 and a Metri-Pack 630 sealed fuse holder. At this point I had left the OEM wiring in place, and simply bypassed it. 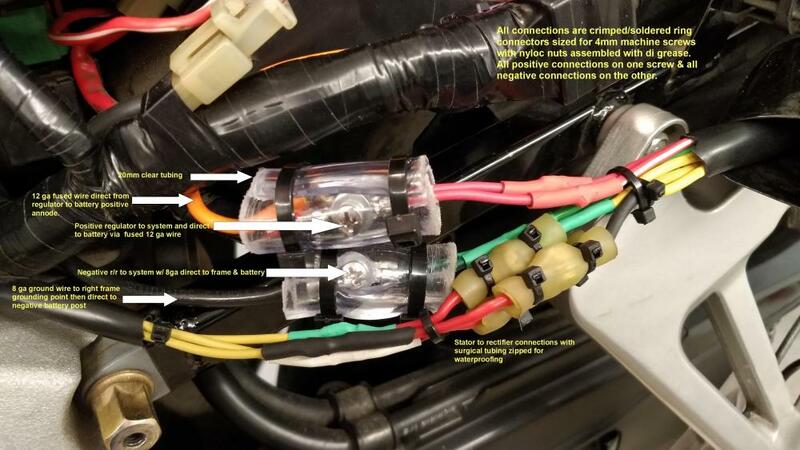 My current preferred VFR charging set-up uses 4mm2 wires running directly to the battery terminals from the Furukawa connector on the Shindengen SH847 AA "series" reg/rec via a 630 Metri-Pack fuse holder (w/30A fuse), and the stator wires have no mid-stream connector at all (they plug directly into the reg/rec's other Furukawa connector, and they're about 3mm2, IIRC). If you've still got the OEM shunt-type reg/rec (especially the flat one), you should consider upgrading to a MOSFET or series-type, as the OEMs don't last forever. It looks like what you've done will keep things going for a bit. I Would then solder any connections between the new reg/rec's plugs and the bike/stator wiring. My system now has the same jumper circuit from reg/rec's -ve output to the frame with beefed up wire and +ve output to battery +ve using heavy wire and a 30amp fuse. I figure the fuses protect the bikes circuits from the battery but also need to handle some 500 odd watts of charge. Don't trust those crimp on terminals (Danger made in China) and whenever possible crimp and then solder them as well. The clear tube insulation will at least let you see what is going on, how does it handle heat? Very nice installation jzh! A setup I will shoot for when the system needs more work. The R/R currently installed is a SH689DA. Looking back in the service records, the only time the RR is mentioned was back in 2004 when it was replaced and the bike had 12K miles on odo (it is now on course for 52K). I guess you just run it till it quits? I take Zarquon's distrust of crimps to heart. I like to solder mine if possible. I'm with JZH -- when its time for the OEM R/R to give it up, no wire scheme is going to save it.. adding a voltmeter up front can help you watch the trend of things and possibly save a tow bill. - General consensus for the charging system fix is to go with the MOSFET or series such as the Shindengen FH020AA or SH847 (series) R/Rs. I havent had the chance to use the SH847 yet, its physically larger and takes some thought for mounting on the 5th gen.
-The whole idea is to over build it so nothing can fail. Thanks very much for your help. I will order up a FH020AA and get it installed. I don't, nor do bike or auto manufacturers, solder anything on a wire on a vehicle. SAE recommends against soldering as well. Solder wicks down wires, making them stiffer and joints more susceptible to cracking from vibration. Additionally, there are differing thermal expansion/contraction rates of copper, solder, and terminal which leads to loosening of connections. Buy the right tools, get high quality terminals from a trusted supplier or dealer. I dislike troubleshooting electrical faults, especially intermittent ones caused by cracked solder joints buried in the wiring harness. If you don't want to invest the time/money to get a good crimp tool and learn how to use it, then I recommend crimping with a cheap tool first and using the minimal amount of solder necessary. Crimping with a $5 crimper and cheap-o terminals is probably worse than just soldering alone, but it's a toss up.